Leftover Bacon? Certainly not a term you hear very often! But, it just so happens that we have some leftover Bacon Jerky with a "best by" date of September 2016. 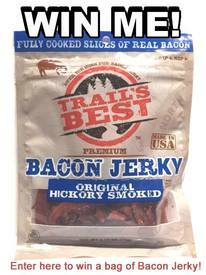 We can no longer sell these, and throwing away Bacon would be a crime … so we are giving away 10 bags of Bacon Jerky! 10 bags of Bacon Jerky will be given away to 10 lucky winners chosen at random (one bag per winner). Limit one entry per person. Limit 1 prize per giveaway per household. All entries must be received on or before11:59 pm EDT on Sunday, August 28, 2016. Drawing will be held on Monday, August 29, 2016, and winner(s) will be notified immediately. Prize(s) must be claimed by 12:00 pm EDT on Wednesday, August 31, 2016. NO PURCHASE NECESSARY TO ENTER OR WIN. VOID WHERE PROHIBITED. VALID IN THE 50 UNITED STATES AND THE DISTRICT OF COLUMBIA ONLY. ENTRY IN THIS SWEEPSTAKES CONSTITUTES YOUR ACCEPTANCE OF THE OFFICIAL GIVEAWAY RULES.